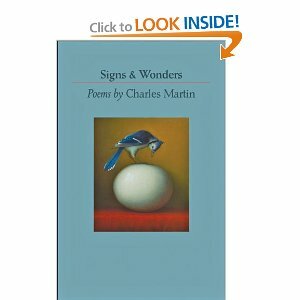 As you begin this new book of poetry by Charles Martin, you’re given the direction to look at the words “signs” and “wonders” in a particular light: signs being used as a noun, while “wonders” is to be used as a verb. A small detail, but one that makes a significant impact on the reading. The implication is that Martin is offering, not complete and finished expressions, but little riffs on which to ponder and reflect upon. My first impression was how varied the poems are-some are short, almost just an observation rather than a poem. Others have a limerick quality, while a few extend to pages of rhymed couplets. For some reason, I was predisposed to think of this as “serious” poetry, but in fact, I giggled uncontrollably at a few of them (“The Spaniard”, for one). Time is the photo peeling from the wall. In total, Martin covers a dramatic amount of subjects: George W. Bush, art, the “unreal” pain of a poet, endangered animals, and suicide. In doing so, he makes thematic comparisons that are never cliché or trite. Only one title, “Poem for the Millennium,” left me lost-I didn’t know what to make of the style and phrasing that was evoking the events of the year 2000. I sense a meaning too deep for me to ascertain! Perhaps if I pick it up again at a later date it'll make sense to me! It must be added that the cover of this book is one of the loveliest I’ve seen…I hope the picture shown expresses just how beautiful the physical book is. Special thanks to Kathy Alexander of Johns Hopkins University Press for the Review Copy. Back in Business, Sort of!